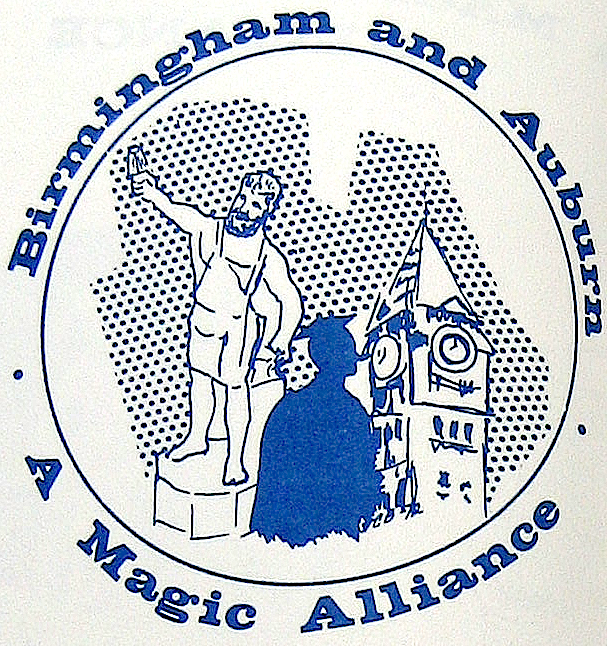 Once upon a time—a time with Iron Bowl parades and regular Birmingham News columns from Auburn professors—the graphic designers for the powers that were were actively trying to combat the perception of Birmingham as the capitol of what Will Collier would call Alabamastan. And drops of the Saugahatchee Creek might eventually rain on Vulcan’s brow. And oxygen breathed from the Botanical Gardens might one day inspire a cough from Pat Dye. It’s practically symbiotic. Related: How Bama remembered Punt, Bama, Punt. Bammerham is the capital of all that is Bammer. All hail Pat Dye !! and has never been properly maintained. The B’ham News wasn’t always the Tide Tribune. Auburn’s Bobby Lowder in the 20’s was the publisher of the News. In later days, Phil Neel, creator of Aubie, also worked for the News.